I was searching for a housewarming present for a friend who I hope won't read this blog until after Sunday. Not having seen her new house or decor, I wasn't sure what to bring. 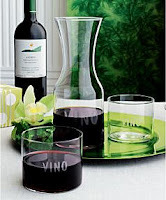 While I was at Crate & Barrel buying my dream pitcher, I came across this little gem. Paired with a few bottles of wine, I think it will make a fantastic gift. And the price? Give me a break. Less than $20 for the carafe and 4 glasses! I think I need to get my own!